Valor Janitorial’s nightly Dallas Texas office cleaning services are tailored to meet the unique needs of your DFW facility. Standard nightly janitorial services include restroom sanitation, vacuuming, trash collection, dusting, and floor care. Our personnel are trained and supervised while on-site to ensure the highest standards of service and client satisfaction. We provide the most outstanding office cleaning service and janitorial service in Dallas-Fort Worth. We make sure that every worker has the proper training and is the right fit for each job. Along with a highly trained and advanced team, we utilize top-of-the-line equipment for all of our clients. Valor Janitorial is the leading provider of floor cleaning and polishing services and commercial carpet cleaning services in the Dallas-Fort Worth area. Valor's many years of experience, modern equipment and best methodologies in the industry, make us the top choice for floor cleaning needs. Please contact us for a FREE estimate. 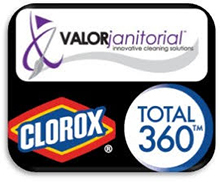 Valor Janitorial is the NUMBER ONE choice for professional Janitorial Services in Dallas, Texas. Contact Valor Janitorial for a FREE estimate. You'll be so glad you did!